Since I can remember, I’ve always wanted to be like the other girl. I’ve written about it before and to this day I still get those pings of desire. Even this morning at yoga, there was a woman in class and she just seemed so dreamy. So in tune with her body. So stylish with her active wear. I was drawn to look at her because her beauty was pouring out of her. She intimidated me, yet I wanted to be just like her. Then she spoke to me in the change room and said something that has stuck with me all day. While she was talking about not wearing undergarments, it hit me in the heart because it had such a greater meaning for me. I haven’t allowed myself to be free. I haven’t freed myself from the desire to be someone else. I haven’t allowed myself to accept who I am. I haven’t allowed myself to realize that I’m okay just the way I am. Once I free myself from my mind and the obsession with the other girl, I will become free. I have this deep seeded desire to talk about real things on this blog. Let this be the first blog post on me sharing my true thoughts, feelings and experiences that are shaping me into the woman I am becoming. The beautiful, sure of herself, in tune with her body, stylish inside and out and peaceful woman. That is me even if I don’t realize it just yet. 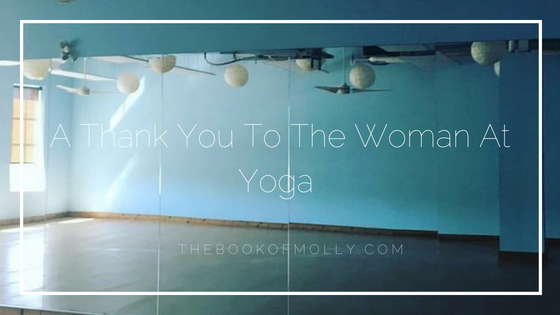 So, thank you to the woman today at yoga (I didn’t catch a name) who doesn’t know she fundamentally changed my mind with one single sentence. I will forever be grateful for that brief moment in time talking about not wearing a bra.